Prisoner resettlement is high on current political and policy agendas. The high reconviction rates of ex-prisoners have been acknowledged for many years but the rapidly rising prison population has meant that more prisoners than ever before are released. This together with the pressure this puts on to the infrastructure of the prison estate and the publication of two influential reports which highlighted the problems faced by prisoners leaving prison has concentrated attention on attempts to ensure that prisoners do not return to prison once released. The resettlement of prisoners is now a priority policy area linked directly to Government initiatives to reduce reoffending. The renewed policy interest in prisoners resettlement forms the context of this volume, which brings together current knowledge and understanding about prisoners resettlement. The book draws on the contributors extensive experience as researchers and practitioners in the field and includes contributions from acknowledged experts. 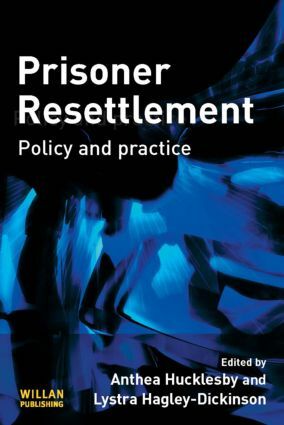 Prisoner Resettlement provides a comprehensive review and analysis of resettlement policy and practice in England and Wales in the early part of the 21st century. In particular it: critically reviews current policy, theory, practice and research on prisoners resettlement explores practice issues through case studies of two resettlement initiatives and an examination of accommodation provision and voluntary sector involvement in prisoners resettlement; and examines the particular issues raised by the resettlement of different groups of prisoners including women, minority ethnic groups, prolific and priority offenders and high-risk offenders.